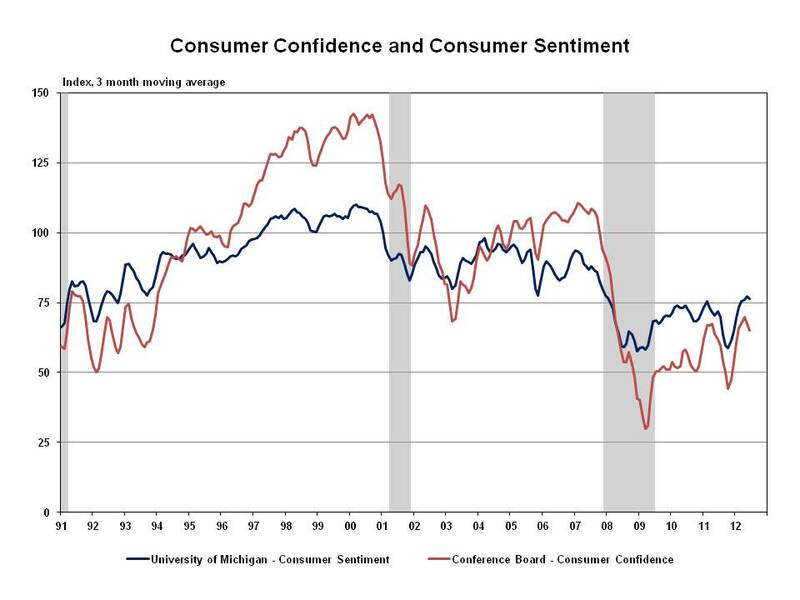 The Conference Board’s Consumer Confidence Index (CCI) and the University of Michigan Consumer Sentiment Survey reported a drop in consumer confidence during June, but the CCI experienced an appreciably larger decline of 7.7 percent from May. The uptrend both indexes had been seeing since the third quarter of 2011 appears to have weakened considerably as the 3-month moving average declined for both series in June. There were some differences between the two data sources, as the CCI reported a 3.8 percent gain in the current conditions component versus a 6.5 percent drop for the University of Michigan survey. Expectations for economic conditions 6 months ahead deteriorated for both reports during June, but the CCI has shown a steady decline in expectations throughout 2012. The recent drop-off in job growth could be one factor behind the slippage in consumer confidence. Indeed, consumers’ perceptions of the labor market have weakened as the CCI shows more than 92 percent of consumers currently characterize jobs as “not so plentiful” or “hard to get” and approximately 86 percent indicate employment prospects will be at best the same 6 months from now. On a positive note, some increasingly optimistic views regarding the housing market can be found in the Consumer Sentiment Survey. The index of relative buying conditions climbed to its highest reading since early 2004, due in large part to record-low mortgage rates. In fact, the survey showed 80 percent reported home buying conditions were good, which marks the highest share since the early days of the first-time homebuyer tax credit.